"I want them for every table." And so, she shall have them. 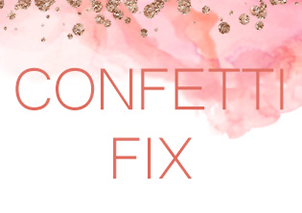 Specifically, bowls-full of macarons in assorted colors and flavors. 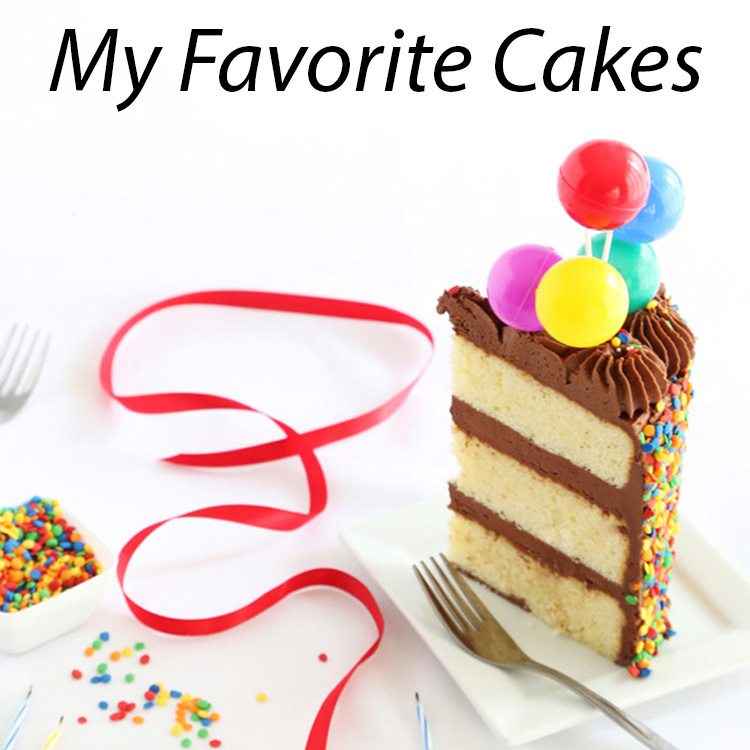 I was giddy at the news and my mind was flooded with inspiration for buttercream fillings; mimosa, lemonade, blackberry, buttermilk, bourbon, mint julep - southern flavors that would do justice to the the location of the nuptials. I had just one concern. I haven't made macarons in months, so a few practice batches were in order. Luckily, I still have the knack! 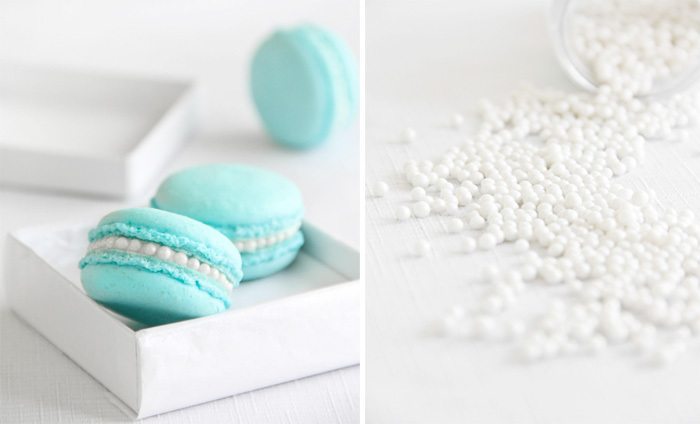 Although macs are already very feminine and dainty, a strand of sugar pearls makes them look even more elegant - almost like they are meant for fancy jewelry boxes instead of the dessert table. I found this idea in a UK-printed magazine simply called "Wedding Cakes". The task of pressing sugar pearls into buttercream one-by-one is a little tedious and time consuming, but just one or two pearl-donned macs can make an entire bowl look dressy. I can handle that. Need help with your mac-making technique? Find my batter folding video here. Preheat oven to 375 degrees. Line two baking sheets with parchment. Sift almond flour and confectioners' sugar together 2-3 times. Set aside. Whisk egg whites with a hand mixer until foamy. Add cream of tartar and beat until soft peaks form. Reduce speed and gradually add extra fine sugar. Increase speed and beat until stiff peaks form. Sift flour mixture over whites with a fine sieve. Discard any lumps or coarse bits that remain. Fold mixture together with a rubber spatula -using short strokes at first -until just combined . The batter will be very stiff. Place a small amount of Wilton Sky Blue gel food coloring on the end of a rubber spatula. Normally powdered food coloring is used, but a small amount of gel does not disturb the batter. I would not recommend liquid food coloring. Use bigger folds once batter loosens. When batter is ready, it should fall from the spatula in a thick ribbon. Transfer mixture to a piping bag. Pipe 1 or 1 1/2" rounds on the parchment lined baking sheets. Let piped macarons stand uncovered for 15 minutes to form a crust. Decrease temperature to 325 just before placing the baking sheet in the oven. Bake pans one at a time for 10 minutes, turning halfway through. Note: After first batch has baked, oven temp should be increased to 375 then decreased to 325 just before the 2nd baking sheet goes in. Cream butter and confectioners' sugar together in a large bowl using a hand mixer or stand mixer. Beat on high speed until light and fluffy. If mixture is stiff, use 1 or 2 tablespoons of cream to loosen. Add orange blossom water in small drops (a little goes a long way!). Beat until flavor is thoroughly incorporated. Transfer icing to a piping bag and pipe on half the macaron shells - don't use too much icing! You don't want the icing to be taller than the pearl dragees. Sandwich with remaining shells. Using a new pair of tweezers (or baking dedicated tweezers) press a line of pearl dragees into the buttercream. These are incredible. 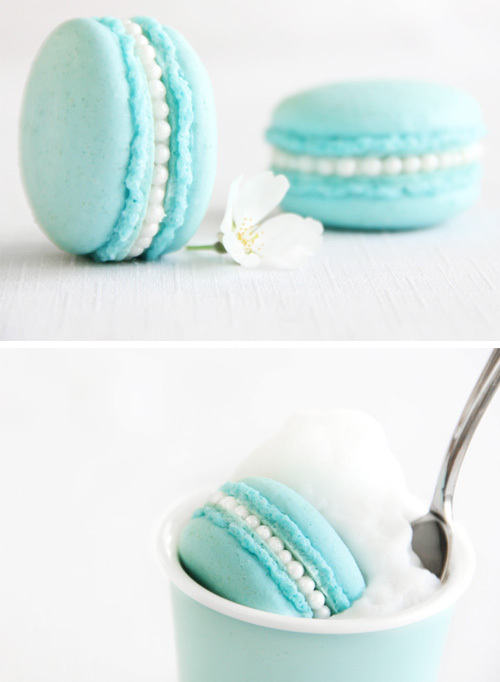 The most perfect Tiffany macaron ever. The pearl idea is genius. Tiffany Blue is one of my fave colors...I use it as an accent color in my house! I had it as my blog colors for 2+ years til I just changed it up last week. Beautiful, these are going to be a huge hit! These are too beautiful! I have yet to figure out the secret to vegan macarons, but I will succeed eventually. The colours of these macs are breathtakingly soft and feminine. The addition of the candied pearls around the buttercream is so delicate. I love this idea and very happy that you shared it with us. These are the absolute prettiest! Awesome idea. These are so beautiful! And thanks for the link to the video....that helped a lot! I've never made these before, but I think I could try now! The photos and the macarons are stunningly beautiful! That is beautiful! I love the pearls! Just wanted to give you a heads up. You might get a little traffic from Pinterest the next few days. I was showing my husband what Pinterest is all about, and your blog, and this post was one of the first things that popped up. I pinned an hour ago, and have already been repinned 11 times. You have a great blog and some beautiful pictures. Thank you for such a great site. This is the most gorgeous thing I have ever seen. I would weep for joy if this were incorporated into my wedding. No, actually, I would probably be speechless and then give you the biggest hug you have ever recieved. As always, beautiful pictures, but these ones are by far my favorite. The Tiffany blue is stunning, and the sugar pearls are breathtaking! These are absolutely beautiful. And that has to be the prettiest Tiffany Blue I've ever seen. The work you've done with these pearls is so intricate. I'm sure it was quite tedious but it paid off so well! Extremela dainty! Those pops are gorgeous. These are simply beautiful and very ladylike with the pearls, totally worth the effort! I'm pretty sure I'd take these over jewels just about any day! :) Everything you make is magic! 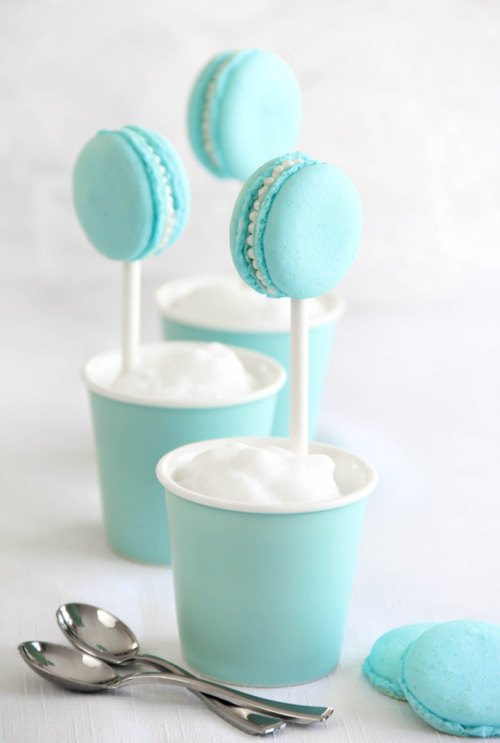 Adore these, simple gorgeous little Tiffany blue macaroons. That is my absolute favorite color too...just gorgeous! Excuse my ignorance, but where do you get orange blossom water? There are orange blossoms blooming down the street from my house...could I make my own?? I wonder if you could line up a row of the dragees and roll the macaroon along them. Even if you had to place two or three by hand it would be faster than the tweezer method for all of them. Love the pearls. It makes them so elegant. i love macaroons! and yours are beautiful... i am curious as to how to get them on the stick for a macaroon pop. i will definitely be experimenting this week. Impresionante como cada entrada tuya! Las perlas de azúcar han quedado divinas. I am in love. They are beautiful! And orange blossom buttercream?! Yum! Also I forgot to say that your photography is amazing! These are beautiful, and so is your photography! Such a beautiful idea and stunning imagery. They would match so well with my tiffany blue champagne layer cake except macs and me do not see to get on - I have yet to make a succesful batch and so I am avoiding them but at least I can stare at these instead to get my macaron fix. Charming and so clever - please tell what they are floating on in the cup....darling idea. I've just been in Paris eating macaroons which were to die for from the best shops, but none were as pretty as your pearl-studded ones. Just beautiful. Thanks to all for your kind comments! Anonymous- warm tea with very heavily frothed milk on top! Thanks for asking! Oh my, these have to be the most ADORABLE macarons!!! I love the pearls around the filling! You're right, I don't think you need to do a whole bowl of the pearl studded macs. these take my breath away! This colour moves me! The little pearls are the perfect addition. Simply eye candy. These are amazing! So lovely! Heard a lot about them. though i have never tasted one, we don't find them. But they look yumm.. So pretty. Simple yet amazing. Great job on the macarons! oh this are stunning! perfect for a Breakfast at Tiffany's brunch I'm producing and hosting next month! Loove it. Pinning now! Nice to find your blog. Your baked goods are amazing. i always come to your site to see the different things you bake/make. 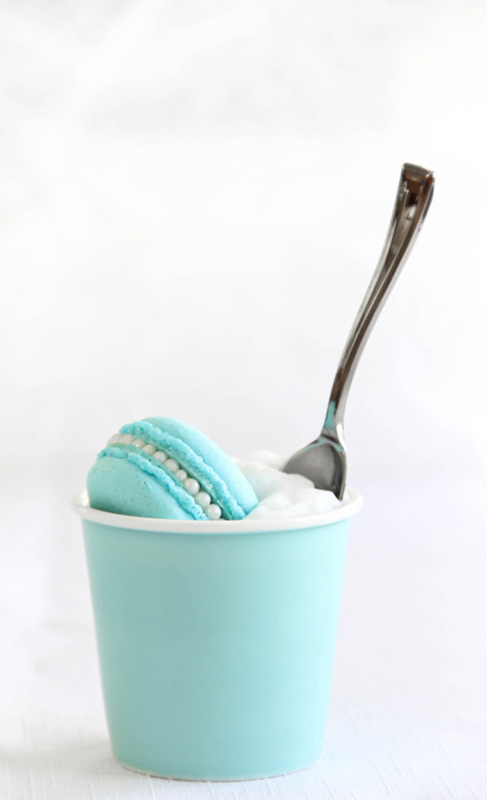 these tiffany blue macarons just topped it off. my recent love for macarons has sky-rocketed, AND to top it off, i love tiffany's. GREAT JOB!! i'm really amazed, i am in the process of learning how to make macarons (bc i heard it was hard to make the outside) but looks so good, i wanna make this. Presentation is just result of creative work, these tiffany blue macarons are well designs. @SprinkleBakes how long will these stay fresh in the refrigerator? And out of the refrigerator? And will the taste or texture be affected by storing them? Sorry for all the questions! But I need to know AYSAP! These are absolutely gorg. You can make the shells ahead and freeze them for up to two months. Just lay them flat (don't stack them) in freezer bags and store flat. Bring to room temperature before filling. I usually don't let the filled macs stay in the fridge for longer than 2 days. Buttercream gets really firm in the fridge, so allow the chilled macs to come to room temp before serving. 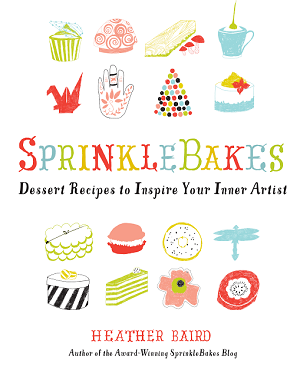 @SprinkleBakes thank you so much! But I was planning to make these today and I don't have cream of tartar... Is there any substitutions I can use? Like buttermilk? Thank you! @Anonymous: You cannot use buttermilk in this. The fat and moisture content is too high. When you are making the shells you have to avoid fat as much as you can. You can do this recipe without cream of tartar. It is seen by some as extra insurance in case there is too much humidity and so the egg whites can peak better. But I make mine without cream of tartar. Always have and I've had perfect macarons. Beautiful! You are so talented :) I can't wait to try making these. You don't have to knock the pan a few times to settle the macaroons, right? Getting ready to attempt making macarons again this weekend. One of my (many) problems is getting a good, consistent, vibrant color in the finished product. I have liquid, gel and powdered colorant. Do you have to make them a lot darker than you want the finished product to be? And how to incorporate the color so it comes out even? I use gel food coloring, and oftentimes not much more than 1/4 tsp. I mix it in just after the whites and flour are mixed together (the batter is thick). Then as I fold the batter to consistency the color is distributed. The color of the batter is usually pretty close to the baked macaron. In my experience you don't need to use a lot of color. Hope this helps Jill - best of luck! These are absolutely gorgeous! I made some tiffany blue Macs a while back and was thinking of those sugar pearls, but it was so much work I settled for writing t and co, now I regret not doing the pearls! Now I am inspired again, thank you! I recieved your book in the post yesterday, and your macaron recipe instantly caught my eye! I've spent months trying different macaron recipes from tons of books...and every time something went wrong with them! I tried your macaron recipe yesterday...and I've never had such a perfect macaron in my life!! I was shocked! Thank you sooo much, your recipe helped me conquer my quest to find the perfect macaron! Can I substitute normal flour for almond flour? What is the cream in the cups? Is it more buttercream? It looks heavenly! Is there a knack to prevent macaron from browning when cooked? Your top burner may be the cause. Try lowering the oven rack one notch, and double up on baking sheets (stack one on top of another, this will prevent the "feet" from overdeveloping). Sometimes food color will cause macarons to over brown. Some gel food colors are not heat safe. Are you using Wilton? Americolor is also reliable in the oven. Just checked .... Wilton gel is available in Australia, so I will have a go using it. Can I substitute the almond flour with regular four? Hi! I wouldn't recommend using regular flour. 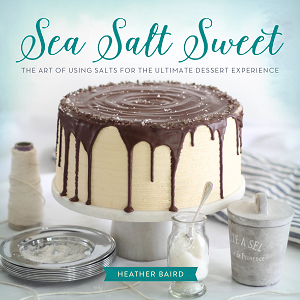 If you do, you'll end up with a completely different type of confection as your end result. You could us many other ground nuts or nut meal as a substitution though, such as pistachio or hazelnut. Hi, I'm having problems with my food color gel (Americolor) fading and browning after I bake the macarons. My heat source is on top and I've moved my rack from the middle down to the bottom. I've also experimented with lowering my temperature at 300F and 275F (while adding cooking time) and I still get browning. I'm confused about what else I can do to avoid this. Any other suggestions? Thanks! Tried several times to get the whites to take shape nothing works. This would be a better recipe if the comment section would stop gloating over how pretty it looks and make some comments on how it works when you try it. Hi Paul, there are several reasons why your meringue might not be coming together. It's hard to say what it is without knowing more info. 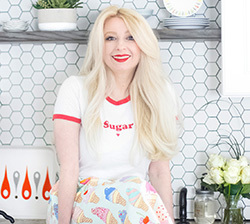 Are you using superfine sugar? Caster sugar is sold in stores, and is processed very fine. It is great for making meringues and macarons. You might also notice if you're getting any egg yolk in the egg whites. This will cause meringue to deflate and it will never come together with traces of fat in it.